What can the U.S. learn from how other countries balance church and state? A government’s relationship to religions practiced within its borders affects all members of society. The freedom to worship is an obvious indicator of a country’s relationship to religion. A more complicated and subtle measure is public control and funding of religious education. From mandated school prayer to the prohibition of prayer in public schools, from prohibiting the teaching of evolution to requiring the teaching of creationism, U.S. educational history is rife with examples of varying levels of government involvement with religious education in public schools. Current First Amendment jurisprudence prohibits direct government control or funding of sectarian religious education but permits government imposition of nondiscriminatory eligibility requirements for funding programs that benefit religious school students and parents. When government provides a benefit, the government—or taxpayers—will want something in return. There is no such thing as a free lunch or a free playground. 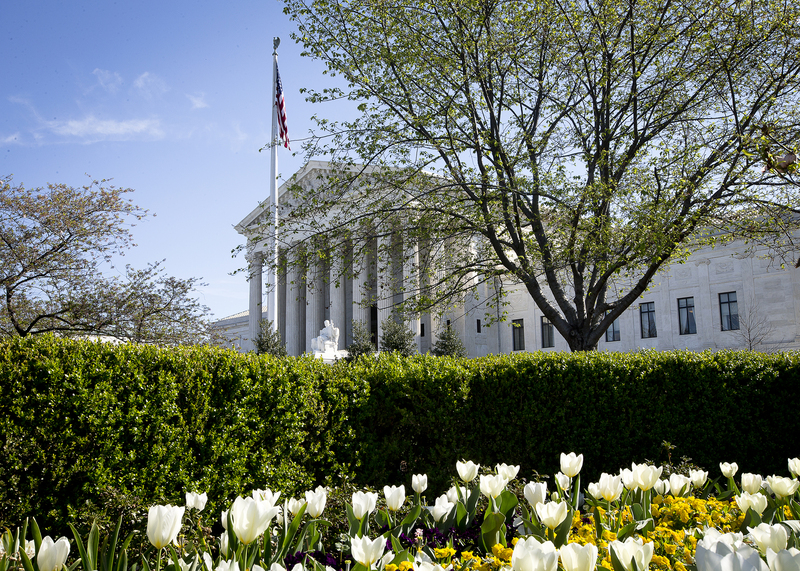 The pending Supreme Court case, Trinity Lutheran v. Comer, will determine whether the First Amendment requires states to treat religious and nonreligious private schools equally when granting aid to education. The specifics of the case relate to a playground resurfacing program, but a wide variety of funding opportunities are at stake in states that provide such benefits. They may include busing, textbooks and equipment as well as tuition scholarships, tax refunds and vouchers to private but not religious schools. Catholic schools, which educate 41 percent of U.S. private school students, may reap short-term benefits from a ruling in favor of Trinity Lutheran, but long-term consequences are less sure. The First Amendment’s dueling establishment and free exercise clauses are unique, but advocates for church-state educational partnerships in the United States can benefit from the experiences of other nations that use or have used public funds for religious education. Surprisingly, France’s secular policy of laïcité does not prevent it from funding religious education. Public schools in the Alsace region, for example, retain their German character by including religious instruction in the general curriculum, and throughout the nation teacher salaries in religious schools under contract with the government are paid by the government. “Under contract” schools must follow a national curriculum and permit students to opt-out of supplemental denominational religious instruction. The vast majority of French “under contract” schools are Catholic, but schools operated by minority faiths, including Islam, also receive state funding. Unsurprisingly, the French populace is divided on the benefits of this program. On one hand, French culture is promoted by providing otherwise marginalized students with national curriculum education. On the other, allocating sparse public funds for religious purposes offends French secular sensibilities, particularly when suspicion of religious minorities is high. The United Kingdom, which has a national church, requires religious education and worship in all state-run schools but permits local variations of the religious curriculum. In addition, the government funds “faith schools” run by various religious organizations. Currently there are 1,985 Catholic, 48 Jewish, 18 Muslim and 17 other faith schools and academies run by various minor denominations. Concerns about extremism and radicalization in some of these schools and prejudice amongst the general population against minority religions have prompted the government to consider a nationally required religious education curriculum that would better “prepare pupils for life in modern Britain.” A final report from the Committee on Religions Education is due in mid-2018. Until the 1960s all schools in Canada were run by religious groups. Public schools are now secular and under provincial control, but funding for religious (primarily Catholic) schools in Ontario, Alberta, Saskatchewan, the Northwest Territories, Yukon and Nunavut has been maintained. In addition, British Columbia and Manitoba provide some funding to religious schools. The secularization of schools in Canada went beyond defunding, however, to include in Quebec a mandatory ethics and religious culture curriculum for private as well as public schools. In 2015, the Supreme Court of Canada upheld the right of a Catholic school, Loyola High School, to teach an alternate curriculum from a Catholic perspective. “To tell a Catholic school how to explain its faith undermines the liberty of the members of its community,” wrote the court. Mexico, like France, rebelled against Catholic political power and went through a fiercely anti-clerical phase. Unlike France, Mexico has achieved complete separation of church and state regarding public education. Private schools in Mexico receive no aid from the government. Two lessons can be learned from the experiences of the European nations with which the United States shares a legal history and its neighbors to the north and south. First, relationships between church and state that are too close can lead to even greater separation. Second, when government provides a benefit, the government—or taxpayers—will want something in return. In short, there is no such thing as a free lunch or a free playground. Religious school administrators should rejoice if the Supreme Court rules religious schools must be treated the same as nonreligious private schools as they, literally, will be on a level playing field with their nondenominational private school competitors. A favorable ruling will not solve all religious school funding problems, however, and even may result in some states denying benefits to all private schools. Alternatively, governments may continue the trend in favor of private school funding, but acceptance of that funding may come with strings attached or engender continued litigation. Religiously inspired violence and discrimination is a problem throughout the world. Free societies have a vested interest in education about and for religion. Balancing the interests of parents, religious leaders, taxpayers and teachers is not easy, but our children are worth the effort. Our future may depend on it. "...when government provides a benefit, the government—or taxpayers—will want something in return. In short, there is no such thing as a free lunch or a free playground." Ellen K. Boegel, who teaches legal studies at St. John’s University in New York, clerked for the U.S. Court of Appeals for the Second Circuit.